Can I skin my own gator? For taxidermy, yes! 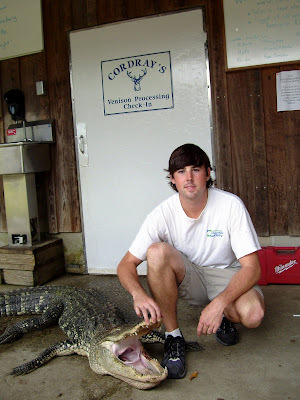 You may bring in the head or just the skin of the alligator to have taxidermy work done by Cordray's Taxidermy. Caped alligators - that's the hide split down the stomach - are used for making alligator rugs or full body mounts. Skins - split down the back - from skinned alligators can be tanned into leather for making wallets, purses, boots, etc. Cheeks and Tail: You'll get the tail and jowl meat processed. Whole alligator: You'll get all the meat from the alligator, including the tender loin meat, plenty of leg meat, and the jowl and tail. You also get the hide back, either caped or skinned according to your request. 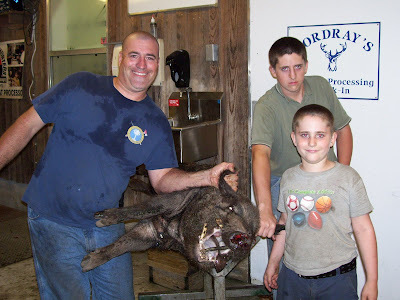 William, William, and Jacob Johnson with a 257 lb. wild hog! 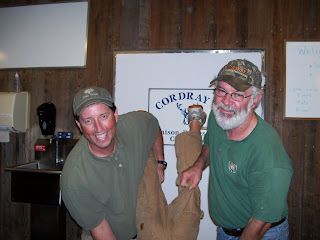 Click here for a map to Cordray's. We're about 35 minutes south of Charleston and about 25 minutes from Summerville. Give us a call for directions, 843.766.7922. 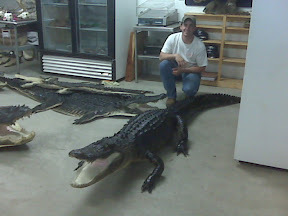 With the upcoming gator season, many folks are hiring guides to help improve their chances of getting the BIG One. Click on the title above to visit their site to find out more. Gator season's just a few days away! Most gators are taken very late at night or early in the morning depending on how you look at it. We're open 9 am to 10 pm Monday - Saturday and Sunday evenings after 6 pm during alligator season. We're also opening just for taking in gators on Sunday mornings from 9 am to noon. So... most people will need a way to safely store their alligator until morning. This burrito bundling works like a charm. Since alligators are cold blooded and are the temp of the cool water they've been in, the ice begins to drop their body temperature quickly. You don't need to field dress an alligator to keep it cool. 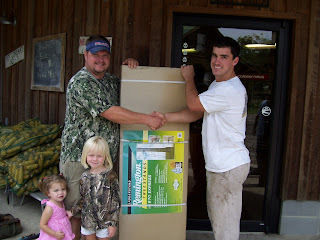 Just pack the whole carcass in several bags of ice, then roll up your tarp and you can keep the meat for several hours. I personally am a fan of the duct tape on the mouth and feet to be absolutely sure the big guy's not going to wake up in a fit of temper! Now, this setup does not work for transporting deer in hot weather! They have to cool from their normal body temperature before the ice begins to help cool the carcass. 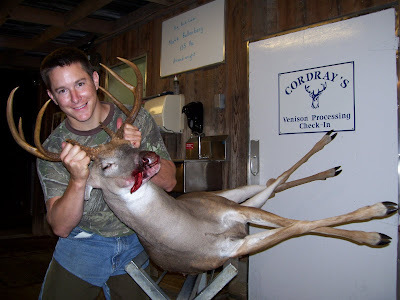 If you need to hold on to a deer for a while before bringing it in, you'll need to field dress it and fill the body cavity with ice! Don't wait too long! Meat spoils quickly in our hot summer sun! We've made some changes to the pricing structure on processing alligators. Just a quick explanation on what's going on... The hide market collapsed with the economy in the fall of last year. We got stuck with all the hides we traded in last year! Needless to say, that was a shock! 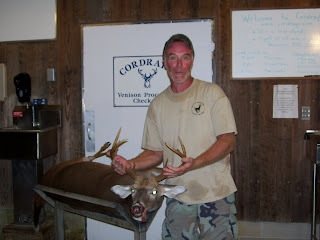 So, this year, until further notice, we're not going to be trading in hides for free skinning. We've tried to try to hammer out a pricing structure that will work for everyone. We hope this will work for you! Alligator meat will come back to you in vacuum sealed meal sized packages with your custom made label. Meat is made into cubed steak and our special alligator sausage. You'll have your gator skinned or caped and we'll process all the meat from the alligator. 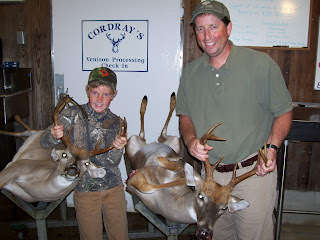 This option gives you the absolute best yield of meat and prepares your hide for taxidermy. We'll process only the tail meat and jowls. You are responsible for discarding the remainder of the animal in a responsible manner. We'll handle the disposal for an additional $20 fee. 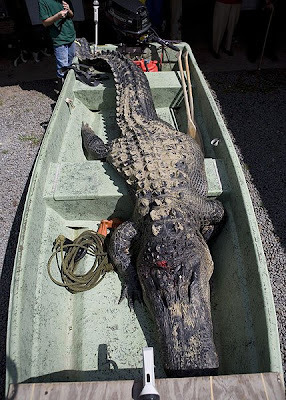 All alligators must be checked in whole, unskinned, with all appropriate tags and paperwork. We will not accept alligator pieces or skinned meat for processing. Why can't Cordray's take boneless meat? 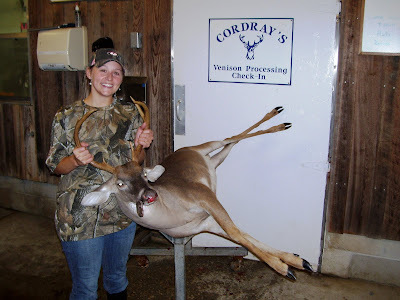 We'll take pieces of venison to process, but they must be large, on the bone pieces. If you quarter your deer and pack it in an ice chest layering ice, meat, ice, meat, you'll be fine to have it processed into whatever you like. However, we do not process meat that has been totally removed from the bone. You might do everything we do using different knives and surfaces from skinning, sanitizing your knives in boiling water, storing boned meat below 30 degrees, and all the other minute details that help keep you safe, but we have to be sure. If we're going to process it, we must cut it up and inspect each piece as it goes through. We can't put our name on meat we didn't process. We really hate to turn you away, so be sure to bring us your meat in a large hunks still on the bone. We'll be taking frozen meat for just a few more days until Sept. 14th. Then we take it again on after the season on January 9th. Matt Bollenberg picks up his tree stand as the winner of the first 2 weeks! 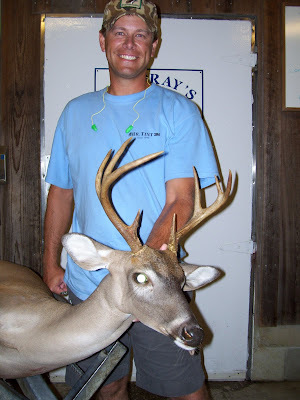 Check out the archives by scrolling down the right column to see Matt's big buck from August. 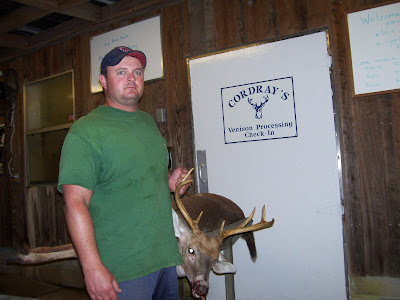 Matt's buck had the heaviest dressed weight at 135 lbs. 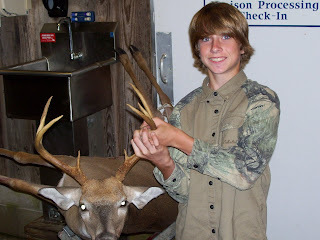 If he remains at the top of the list, he'll win the shotgun at the end of the year and be 2009's Big Buck Winner. Good luck, Matt! What can you make from Wild Hogs? Wild hogs can be made into any fresh cuts or sausages, both linked or bulk. We slice boneless pork chops and package the spareribs for you. Wild hogs don't have enough belly fat for bacon, but we make a terrific smoked ham! If you have the hams smoked and then slice and fry them, you'll be out hunting hogs every day!